Now that you have recompiled your changed components with the new File Version information, in order to create a patch there is very little to do. The patch is based on the previous version, and when built, an MSP file will be produced containing only the new or changed DLLs which were part of the previous version. 2. Notice that the Create Patch dialog is headed Create as a copy of Application IIPERSON Version 1.0.0. When you build the Patch package the differences between current application components and the last deployed version are analyzed and a patch install file (MSP) is created containing only the changed components. Accept the Patch number generated (1.0.0.1). 4. The Package Maintenance dialog will open. Note that most of the options are disabled. These will be as defined in the Version 1 package. II_EDIT, II_STORE, II_DATA and II_BRWSR. 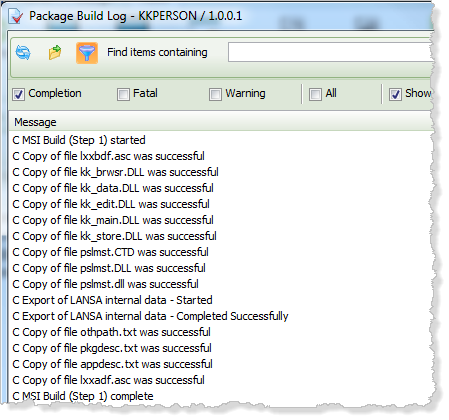 When you build the patch package, the deployment tool will analyze all the components included in Version 1 and create a patch package install file (MSP) containing only the changes, in this case the four DLLs list above. 6. In the Package Maintenance dialog, click Save. 7. Check the Package. No errors should be found. 8. Build the Package. A message box is displayed prompting a rebuild of the cross references. In this case answer No, as there have been no changes to the structure of the application. You would need to rebuild the cross references if your application changes had introduced new components used by the main form (copy of II_MAIN). 9. Review the build log. You should have no fatal or warning messages. If you filter for Completion messages, and scroll through the build log to find the copy DLLs steps, you will find all the application DLLs are listed at this stage. 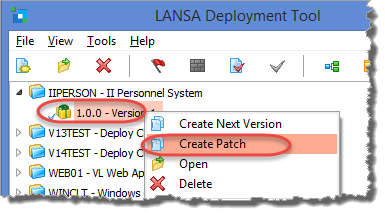 Note: If you examine the contents of the patch install file (MSP) you will find it contains only the changed DLLs. In this case it will contain only the four changed DLLs. If you have a utility such as 7-Zip installed (open source software) you can view the contents of the MSI or MSP file. 10. Close the Package Maintenance dialog.